YouTube/Foot LockerFootlocker’s latest ad stars an ‘excited’ Tim Duncan. It’s a chilly morning in New York and London. Warm up with these advertising stories. 1. Apple is planning to turn around iAd by venturing into programmatic for the first time. Apple’s mobile advertising unit is partnering with automated advertising company Rubicon Project. 2. Here’s how fashion retailer C.Wonder has become one of the top lifestyle brands. Morgan Stanley recently named the brand one of the top accessories companies, alongside industry heavyweights Michael Kors, Coach, Tory Burch, and Vera Bradley. Fans of C.Wonder love its preppy aesthetic and bright colours. Celebrities like Jennifer Lopezhave also been spotted wearing the gear. 3. 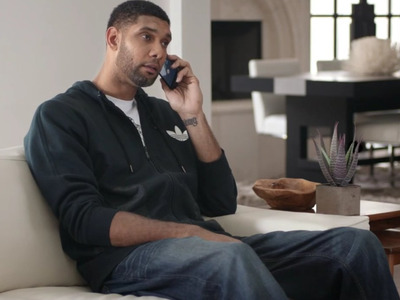 Footlocker has released a new commercial starring basketball players Derrick Rose and Tim Duncan. The ad amusingly plays on Duncan’s “boring” persona. 4. Mozilla’s Firefox browser has dumped Google search for Yahoo. The new 5-year contract means Yahoo will become the default search engine for US users of the world’s third most popular web browser. 5. Uber’s latest PR disaster, in which its SVP for business Emil Michael outlined a plan to dig dirt on journalists, is actually having an impact on its brand, Digiday reports. Some journalists had questioned whether it was only the media that cared about the flap, but data from App Annie Intelligence shows Uber’s download rank plummeted from 24 to 41 since Nov. 15 and a WikiHow article on how to cancel an Uber account has experienced more than a “10,000%” increase in visits versus March. 6. Nielsen is to begin measuring Netflix viewing, the Wall Street Journal reports. The effort is designed to help content owners gauge the impact of licensing shows and will help prove or disprove assumptions about shifting content viewing habits. 7. The Drum has asked marketing directors from Honda, RSA, and Diageo to divulge the big mistakes agencies make when pitching for new business. Failing to understand a clients’ brand, sending blanket emails and not understanding commercial impact are among the most common errors. 8. Yahoo is still feeling acquisitive for ad tech, Re/code reports. MediaMath, RadiumOne, and Turn are among the companies apparently being considered for purchase by CEO Marissa Mayer. 9. Conde Nast has agreed to charge media buying network Group M only if an entire ad is visible to a user, according to AdAge. The agreement is far stricter than the generally-accepted industry standard of 50% of an ad being in view. 10. The New York Times and the Washington Post have both just debuted new native advertising formats, MediaPost reports. The NYT’s first ever print native ad placement was an eight-page print wrap, while The Washington Post launched “BrandConnect Perspective,” a native ad feature that gives advertisers the chance to publish opinion pieces.